My close-up – Amanda, Lady Harlech kindly mentioned Dr. Daian Zou. 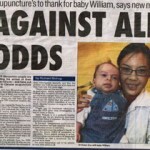 Acupuncture hope for childless couple. The battle to have a baby – Can this woman work miracles? BBC Radio Shropshire on 5th Aug, 2008. In the interview Dr. Zou talked about Chinese medicine for sports injuries, pain relief, and Chinese medicine used in the Beijing Olympics. By Jim Hawkins from BBC Radio Shropshire 10:00 – 10:30am 21st June, 2007. Dr. Daian Zou answered questions about Acupuncture and Chinese medicine. She demonstrated on how to diagnose and execute an acupuncture treatment on Radio. "In the space of 18 months, a total of five women who thought they would never have kids fell pregnant after treatment from the same Chinese acupuncturist – Dr Daian Zou, based in St. John’s Hill in Shrewsbury."